Anthropology & the Art of War – Patrick F. Clarkin, Ph.D.
Last week, the American Anthropological Association held its annual meeting, this year in the beautiful city of Montreal (for a couple of summaries of the conference, see here and here). Rahul Oka, from the University of Notre Dame, asked if I would like to be one of two discussants for his session (co-chaired with Nerina Weiss) “Traces of Violence and Legacies of Conflict,” and I agreed. The session was full of very erudite presenters who spoke on a range of topics related to the anthropology of conflict and violence. But in preparation for the session, I have to admit to some trepidation because nearly all of the presenters were ethnographers or archaeologists. And as a biological anthropologist, I felt out of my element. The presentations were also quite diverse in geography, time period, theoretical perspective, and outcome variable, ranging from structural violence and undocumented border crossings from Mexico into the United States, to skeletal trauma in Neolithic Europe, to Kurdish survivors of torture. I found it hard to discuss the various papers with much sophistication and detail while also finding commonalities among them (and all in fifteen minutes, no less). I tried, but finally concluded that it probably wasn’t going to happen. Therefore, I decided to do a rather broad analysis of the papers, which I read ahead of time. But there was always the risk of zooming out too far, thereby making any analysis overly simplistic and virtually meaningless. 1. War and large-scale violence harm more than military personnel. From the perspective of the media and policy makers, there is a tendency to focus on nation-states, and whether military actions are successful. Who’s ‘winning’ the war? From an anthropological perspective, the concern is more with the everyday people on the ground. In nearly all of our presentations, there was the common denominator that civilians were harmed through mass slaughters of villages, violence through slavery, forced displacement, defaced or confiscated property, psychological trauma, etc. War is not healthy for children (or other living things). As Rahul said at the conference, anthropologists tell stories. Our populations, time periods, theoretical backgrounds, and variables of focus may vary, but what we have in common is that we are concerned with some story of people’s lives that in all likelihood would not be told otherwise. This requires active, systematic research and data collection under sometimes risky circumstances. It is important to remember that people are not just passive recipients of their surrounding environments, subjected to circumstances beyond their control. They are also semi-autonomous agents with the ability to adapt, or at least make the most their circumstances, however horrible they may be. This is also true during times of war and violence. War and violence are such relevant topics, and anthropological perspectives are sorely needed. Sessions such as this one, and other works like the 2010 book “The War Machine and Global Health” (edited by Merrill Singer and G. Derrick Hodge) are a good way to bring anthropologists of different perspectives together. Collectively, they can make strides in illustrating the way war and structural violence has real impacts on human lives. There is no clear segue into this next section, but I recently saw a 3-D video interpretation of Picasso’s famous painting Guernica, an obvious commentary on the brutality of the bombing of the Basque town, and perhaps war in general (for example, the hidden skull in the horse’s body). 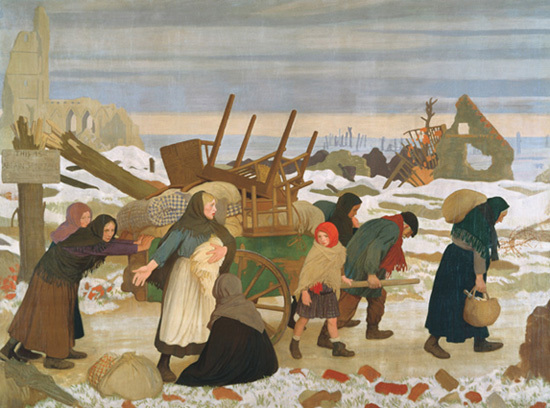 It got me thinking about other works of art that focused on civilians during times of war, rather than on famous generals, battles, etc. Below are just a few examples. 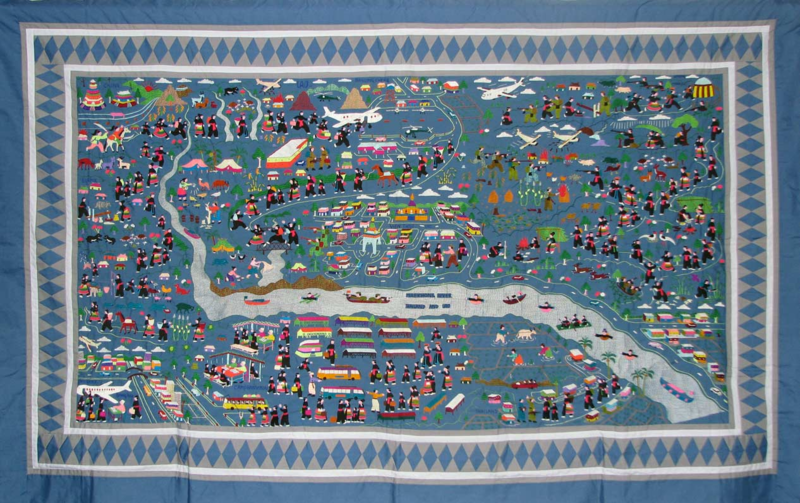 Hmong embroidery (paj ntaub translates as ‘flower cloth’) has a range of styles, but one of the more common varieties depicts a narrative of the ‘Secret War‘ in Laos and the subsequent flight to refugee camps in Thailand. Hmong, shown in traditional black clothing, are shown fighting and fleeing from Pathet Lao and Northern Vietnamese troops (though the reality was obviously more complex than this). 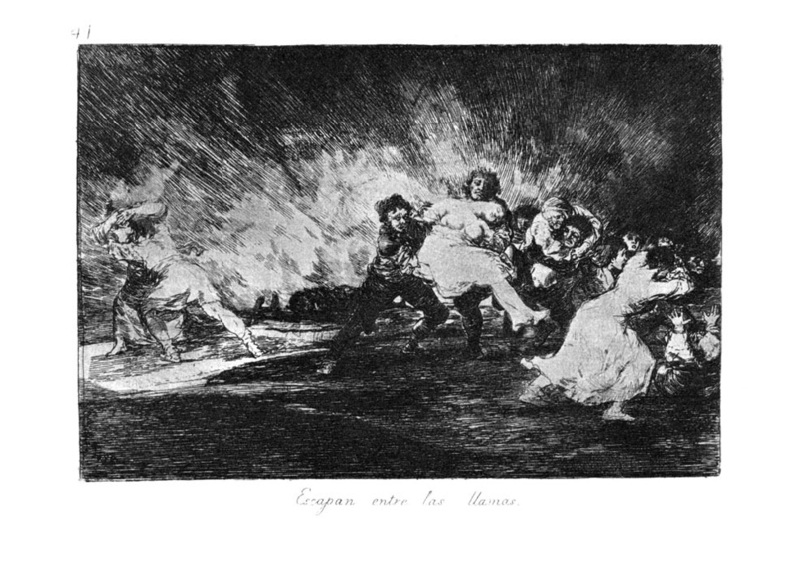 Some works are a bit older, such as Jacques Callot’s 1633 The Great Miseries of War and Francisco Goya’s 1820 The Disasters of War. What the above artworks have in common is that they try to make an unsanitized portrayal of war’s brutality toward civilians, rather than solely as a military contest. When the elephants fight, it’s the grass that suffers. This proverb has been attributed to multiple cultures, including from East Africa and Laos. I’m uncertain of its actual origins, but the basic premise still stands – the little people suffer when powerful militaries collide. 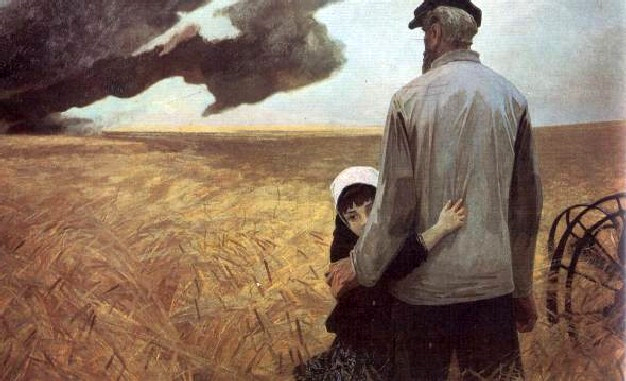 Note: If anyone can suggest other works of art (preferably paintings) related to war and civilians, please feel free to comment. -PC, Nov 26. This entry was posted in anthropology, Cooperation and conflict, War and health and tagged American Anthropological Association. Bookmark the permalink. Suffering is a normal and expected part of war, but a cold fact is that some people enjoy it and profit from it. Was there any hint of this at the conference? There are degrees of enjoyment and profit. Some are clearly immoral — profits made from large scale arms manufacture and sales are easy to condemn (although by doing so, one is often condemning governments or contestants — which comes to condemning violence or arguing that murder should be limited within ‘acceptable’ boundaries). Others are perhaps unintended: those in conflicts can become addicted to the adrenalin rush of combat, which becomes almost a super-game or gamble. When winning becomes so important in the game, can we really understand the recent trial of those serviceman who ‘killed for sport’? In sentencing them, should their controllers not also be sentenced? Any hint of this at the conference? Even less intended is the small-time profit from selling war-time souvenirs, reminders of something that should never have happened but perhaps should not be belittled by flippant souvenirs. In Laos we still sell B-52 spoons — made from left-over unexploded ordnance. The Hmong selling paj ntaub (pa jau) story-telling embroideries depicting a version of the 2nd Indochina War that the American buyer wants to see. They fall into the same category as the spoons — although on the other side of a political chasm. We should be familiar with the reality of the horrors that America did in Laos without the consent of its own Congress. Unfortunately, most Hmong who experienced the war are not in a position to make embroideries to sell to foreigners (these embroideries by the way were never banned in Laos — not even in the streets of Vientiane — every dollar was needed). They are not in a position because they are dead — and comparatively a small percentage were killed by north Vietnamese, most were Hmong killed by Hmong. With the ceasefire and Truce of 1973, open hostilities ended. The Secret Army didn’t need its huge fighting forces of Lao, Hmong and Thai (yes 25% of the secret army was Thai — mostly official Thai Army battalions) and it was a financial drain to keep them when it was clear the war had been lost. Many soldiers who had fought for years on the American side and their accompanying families returned ‘home’ to the areas they had farmed long before 1973. America let them go, the Pathet Lao let them come. There were no parades of veterans. During the first two years of ‘peace’ a recorded 18,000 such farmer-soldiers were killed — not gassed by the Pathet Lao but killed by the unexploded American ordnance that littered and continues to litter the hill-farms and padi-fields. Peace, during the first two years at least, brought a greater recorded death toll than any year during the war. That’s not recorded in Hmong embroidery, but it is recorded in records kept by both sides at the time of ‘coalition government’. Pictures of war and its aftermath, however gruesome and however great the artistic merit, carry a message. Whether we agree with the message or not, the message continues the propaganda that is an aspect of every war. Good versus evil. Propaganda has an open agenda of reaching out to ordinary people and convincing them that the enemy is less than human and therefore killing them is not murder but duty. Was this small point touched on by the meeting of academic minds? Can you kindly point me to the source for the 18,000 deaths in the first two years of ‘peace’? I’ve seen the 2010 Lao National Regulatory Authority report by Mike Boddington and Bountao Chanthavongsa, but theirs was a retrospective study. By the way, I agree that America did horrible things in Laos. The two million tons of bombs dropped there is another shameful episode in US history. Some of these points were touched on by the speakers, but not all. The archaeologists were dealing with wars and conflicts from the past, so they were certainly not involved in participant observation. Of the ethnographers, some had been in Zagreb or Sarajevo, Somalia, Israel/Palestine, or other places. War as profitable and enjoyable was addressed, as was the propaganda of good vs. evil. As for the history of the war in Laos, that wasn’t covered in much depth at all (if only I had more time). I think you should submit an abstract for next year’s AAA meetings in San Francisco. Why not?